For the more musically inclined amongst our readership, this past weekend was particularly noteworthy due to an amazing confluence of events. First off, in the north of the city, the first annual Veld Electronic music festival was happening at Downsview Park headlined by Canadian electro champ, Deadmau5. Meanwhile, marching across the city, the party formerly known as Caribana was celebrated along the lake shore. Following that was Drake’s third annual OVO Fest that featured some of the biggest names in rap and hip hop. And not to be outdone, Montreal rolled out its Osheaga music festival, which has been around since 2006, and this year featured a lineup headlined by The Black Keys and Snoop Dogg (err.. I mean Lion). Despite all of that, there was another sizable music event happening right in downtown Toronto in an event space that, really, does not get enough acclaim as a solid outdoor venue for concerts. 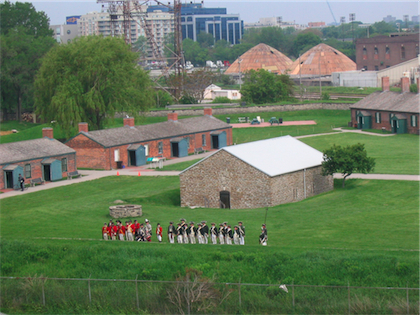 That’s right, I’m talking about Fort York. And I’m talking about the double barrel blast that is M83 and Justice. Stretching out west from Bathurst Street, tucked in north of the Gardiner Expressway, is the home of historic Fort York, with all its wide expanses of green grass and old looking buildings. For me, the mention of Canadian forts conjures a nostalgic mix of modest excitement (battles fought in forts!) followed by inevitable disappointment (old forts have no battles). But nevertheless, Toronto hosts one of the more famous ones that was apparently used to repel American forces in 1812. So hurray for that. Let’s rewind to 2009 (or fast forward from 1812). That was my first experience with Fort York as a pretty tremendous concert venue. That July it hosted the Rogers Picnic (what happened to those, by the way? Consumed by the same corporate sponsorship overload as V-Fest?) that included bands like Animal Collective, Cat Power, Vampire Weekend and Dizzee Rascal. Let’s reflect on that for a second. A day long music festival happened in downtown Toronto and you didn’t need to take a boat to get to it. For this past weekend, the lead up the main acts featured the likes of Charli XCX, Buraka Som Sistema and Austra. Forgive me if I appear to short change them. In my quest to maintain my journalistic integrity, I must admit that I was enjoying some air-conditioning far too much to venture down to the Fort during the heyday of the heat. To sum up: I like some Charli XCX songs, don’t know Buraka, and Austra I can live without. Thinking on it now, the concert didn’t appear to have any overarching reason for being. Sure, there were the usual overly visible sponsors and food trucks. Drinks were being served via a beer ticket line (which is the worst) but at least there is no longer a need to be fenced into a beer tent ghetto. If for no other reason, the Ontario Liberal government can be thanked for that. Despite the brewing ominous clouds, M83 took the stage prepared to do everything in their power to blow the potential for bad weather away. They’ve always been a band that, while experts in constructing sometimes ominously opaque music, usually end up embracing sunny vibes. I’m referring to them in plural but M83 is now really the brainchild of Anthony Gonzalez, who had formerly partnered with Nicolas Formageau to craft some truly exquisite electronic confections. Since the release of 2008’s Saturdays = Youth, M83 has strove for a symphonic combination of electronic texture and orchestral bombast, with a dappling of saxophone solos. Naturally, the highlight of their set came when Gonzalez looked to the sky and informed us that the next song may stop the rain from coming. And then they unleashed ‘Midnight City’. It was ultimately fitting that an orphaned electronic-based band like M83 would play a show in Toronto at an ignored venue on the same weekend that a huge electronic music festival was happening. The rain came eventually, thankfully after the M83 set, first in heavy drops, then in steady sheets. Admittedly, Fort York doesn’t offer a ton of rain cover but as you usually find at a concert, people tend to just roll with it and embrace the wet and mud. Finally, as the rain abated: Justice emerged. The golden cross glowed and the impossible bass riff of ‘Genesis’ began. 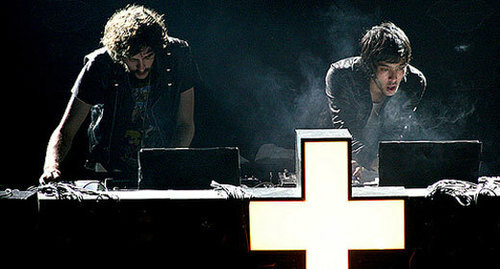 Justice is definitely one of the few super-serious, yet super-ridiculous bands (I’m just gonna call them a band even though they are just two guys at computer/mixer decks) working today. Any time a band’s key piece of iconography is a glowing crucifix and they aren’t concerned with saving your soul, well, then you know you’ve entered a special place. As if to show proof of a benevolent God, the heavens ceased their downpour and allowed the audience to jam to a classic mix that included ‘Newjack’, ‘Civilization’, ‘Canon’, and the ubiquitous ‘D.A.N.C.E.’. Only on cue, with the terrifying opening riff of ‘Stress’ did the skies reopen to balance the scales. A final medley featuring ‘Audio, Video, Disco’ finished it off. All told, the fears of a massive mud pit were unfounded and everyone shuffled out to the streets of Bathurst and Fort York Boulevard. Yes, it was nice to leave a concert and find yourself, not in the warrens of Downsview or the parking lot oasis of the Exhibition grounds, but within a reasonable distance to transit, after parties and yes, even home.